Get warm and cozy this week. I’m giving you a week of crafts and ideas on how to keep you warm this winter. Most of the ideas are crochet since I have been in a crocheting mood lately. Which is perfect because we are expecting heavy snow today. Darn you weatherman. I live in the South so I can have warm winters. None of this snow business. Although, what I like on a snowy winter day is to cuddle up with a warm blanket, a good book and hot cider. 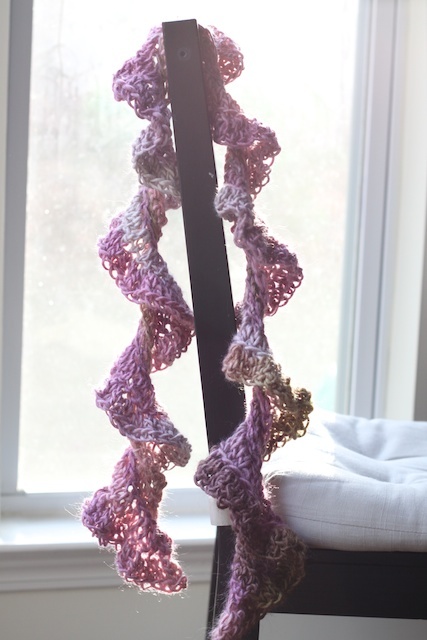 Today we start off our warm and cozy week with a twirly crochet scarf I made for myself. It was a quick, last minute project. I was going out and wanted a scarf to go with my outfit. So I pulled out my crochet hook and yarn and went at it. I used a large P size hook and a really soft yarn. If you make something inspired by Simply Modern Mom, please upload pictures of it to our Flickr group to show it off to everyone. You may be featured on Simply Modern Mom. 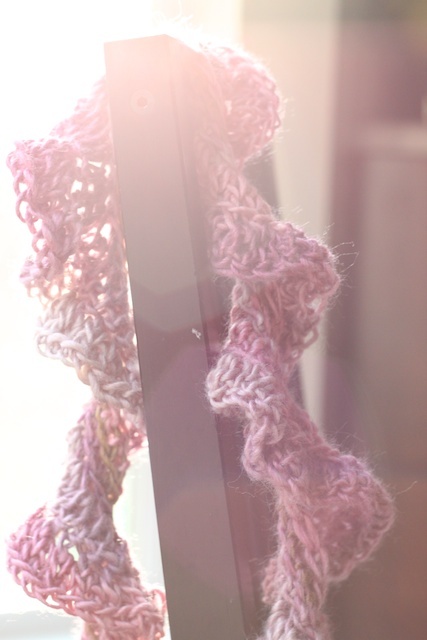 If you crochet, here are the instructions to make your own. row 1: sc in the second ch from the hook. [1 sc in each ch] to the end. row 2-3: [1 sc in each sc] to the end. ch 2 and turn. row 4: [2 dc in each sc] to the end. ch 2 and turn. row 5: [2 dc in each dc] to the end. fasten off and weave in all yarn ends. » Tell me… What’s your favorite thing to do on a snowy winter day? this is perfect for today! i’m in north georgia with all the snow. almost have this scarf completed. thanks for the tute! enjoy our snow day! Oh how pretty! It’s perfect for cold days where you want a colorful nod to spring. Thanks for the details, I’ll be linking. Thanks for the pattern! I whipped one up over the weekend… Love it! Why does mine seem so much shorter than yours? Gah. 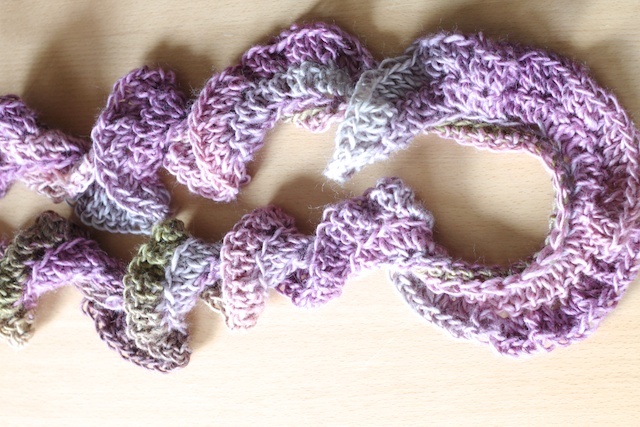 I hate ripping out work…but I really like how this scarf looks. Beautiful scarf. 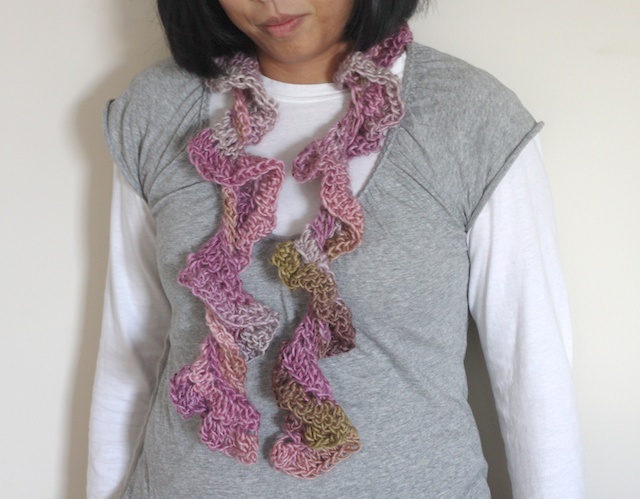 What kind of yarn did you use and was it just one skein? This is such a great little pattern! Unfortunately, I have’nt crocheted in years and don’t remember the various stiches. Can you possibly post them, ie: (sc,dc,ch,etc.)? I was just curious…Ch 75 seems pretty short compared to how long it looks in the picture. Any ideas on that?